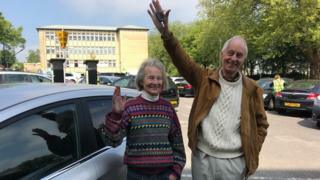 An elderly couple who forgot where they parked their car have been reunited with the vehicle five days later.Emmanuel Elliott, 81, and partner Hilda Farmer, 79, left it somewhere near Cheltenham General Hospital on Friday, but could not remember where.It was found on Tuesday in a car park about 900m from the hospital and had been ticketed three times by wardens.Mr Elliott said it was "marvellous" to have the vehicle back.Ms Farmer thought she had left it on a street "within a mile and half" of the hospital with "nice houses on one side" and "greenery on the other". But after it was discovered in St George's Road car park, she said she must have "dreamt it when I realised I couldn't find the car". "It's been quite a five days," Mr Elliott added. "I hope I can remember how to drive." He said Ms Farmer's granddaughter had located the car with help from her social media followers after the story was featured online.Several people contacted the BBC to say they had also seen it. Cheltenham Borough Council said the car had been given a number of tickets "as any vehicle without a valid ticket would".A spokesman said they would not immediately cancel the charges but pointed the couple to the authority's appeals process.